Ted is the Chief Market Strategist and Vice President in charge of the Zaner Ag Hedge Group and specializes in agricultural hedging employing various strategies using futures, futures spreads, outright options and option combinations. He believes it is paramount to be able to use different strategies to adapt to market conditions. Ted works with large to mid size grain and livestock producers and end users in North, Central and South America. 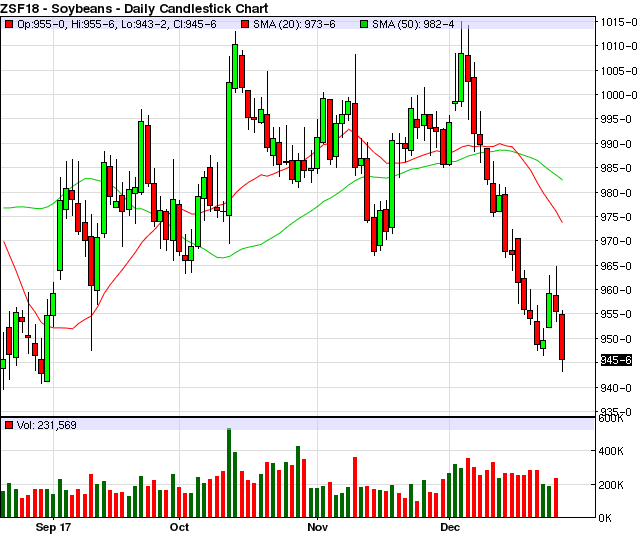 Can Soybeans Keep it Together? TRADING COMMODITY FUTURES AND OPTIONS INVOLVES SUBSTANTIAL RISK OF LOSS ANDMAY NOT BE SUITABLE FOR ALL INVESTORS. YOU SHOULD CAREFULLY CONSIDER WHETHER TRADING IS SUITABLE FOR YOU IN LIGHT OF YOUR CIRCUMSTANCES, KNOWLEDGE AND FINANCIAL RESOURCES. Corn and Wheat continue to be under pressure, but the soybeans have managed to hold their ground. While there could be some negative fundamentals lurking for soybeans they have been the strongest component of the grain complex for some time now. 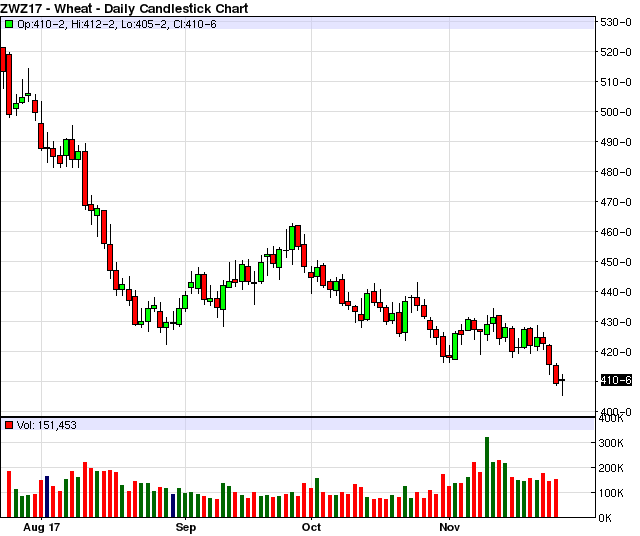 Can soybeans continue to stay relatively strong compared to corn and wheat, or will they play catch up soon? There are growing questions about soybean exports reaching the USDA forecast. Both export sales and shipments are falling well behind the pace of last year while the USDA is looking for a 3% increase in exports this year. This comes at a bad time because we are right in the heart of our soybean export season. There sill is a lot of time left in the marketing year, and soybean demand has consistently outperformed expectations in recent years, but the lackluster sales and shipments is a growing concern to say the least. If there were a big problem in South America the US soybean supplies could fall quickly as we compensate for a short crop. However, South American weather also looks mostly good so far. There is some concern about La Nina having a negative impact on the Argentinean crop but with Argentina only about 50% planted at this point it is too early to tell. The market may be holding some weather premium just in case. It's that time of year again, the acreage debate is starting to heat up. The USDA got it officially started this week issuing a Baseline forecast of 91 million acres of soybeans and 91 million acres of corn. If realized this would be a small increase in corn acres and an 800k acre increase in soybean acres (mostly coming at the expense of wheat). Depending on who you ask this might be too much or too little of an increase in bean acres. On one hand the corn/bean ration is favoring more soybean acres as soybeans are values 2.62 times higher than corn. Also, in a tight margin climate bankers may be looking to encourage producers to plant soybeans with lower input costs. On the other hand US producers feel comfortable planting corn after a year with less than perfect weather and still managing to make record (or at least near record) yields. The rotation has also gotten more soybean heavy in the last few years andsome producers may havea need to go back toward corn. We will see how this shakes out, but it seems likely that we will have a lot of soybean acres. However, despite the potential negative fundamentals on the horizonthe path of least resistance for soybeans may be higherin the short to near term. Why? 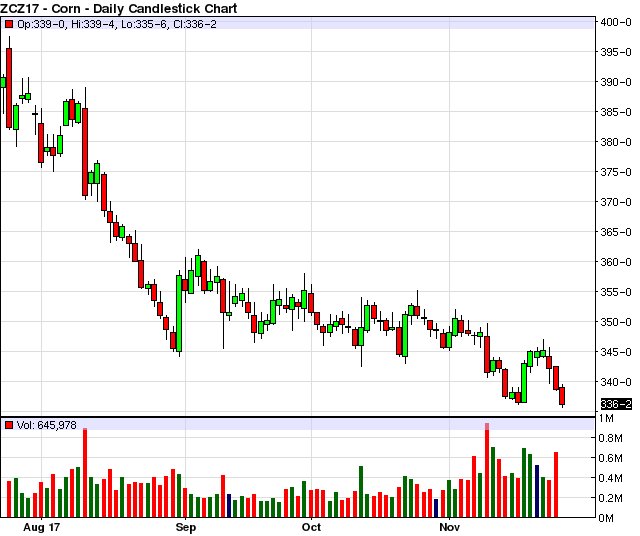 Well, look at a soybean meal chart. Soybean meal has been sharply higher in the last few weeks and is testing the highs from the last 6 months. Some of this may be coming from concern about Argentina and La Nina as Argentina exports a lot of soybean meal. Some of this may be coming from the aggressive pace of putting animals on feed here in the US. Some of this may be coming from the idea that China will be back in the market for US DDGs and the feedstock market could get tighter. Some of this could be a oilshare re balancing from the large speculators. Either way, soybean tend to rally when soybean meal does. Soybean meal could fail here in an epic 2 month double top, but if not soybeans may want to follow higher. Keep an eye on meal. Give us a call if you would like more info on the strategies we are using or if you would like to set up an account to put a plan in action. Ted Seifried - (312) 277-0113. Also, feel free to give me a call or shoot me an email if you would like to talk about your marketing plan, the markets, weather, or just to visit.Follow me on twitter @thetedspread if you like. Producers looking to hedge all or a portion of their production may be rather interested in some of the options / options-futures strategies that I am currently using. In my mind there has to be a balance. Neither technical nor fundamental analysis alone is enough to be consistent. Please give me a call for a trade recommendation, and we can put together a trade strategy tailored to your needs. Be safe! Futures, options and forex trading is speculative in nature and involves substantial risk of loss. This commentary should be conveyed as a solicitation for entry into derivitives transactions. All known news and events have already been factored into the price of the underlying commodities discussed. The limited risk characteristic of options refers to long options only; and refers to the amount of the loss, which is defined as premium paid on the option(s) plus commissions. FOR CUSTOMERS TRADING OPTIONS, THESE FUTURES CHARTS ARE PRESENTED FOR INFORMATIONAL PURPOSES ONLY. THEY ARE INTENDED TO SHOW HOW INVESTING IN OPTIONS CAN DEPEND ON THE UNDERLYING FUTURES PRICES; SPECIFICALLY, WHETHER OR NOT AN OPTION PURCHASER IS BUYING AN IN-THE-MONEY, AT-THE-MONEY, OR OUT-OF-THE-MONEY OPTION. FURTHERMORE, THE PURCHASER WILL BE ABLE TO DETERMINE WHETHER OR NOT TO EXERCISE HIS RIGHT ON AN OPTION DEPENDING ON HOW THE OPTION'S STRIKE PRICE COMPARES TO THE UNDERLYING FUTURE'S PRICE. THE FUTURES CHARTS ARE NOT INTENDED TO IMPLY THAT OPTION PRICES MOVE IN TANDEM WITH FUTURES PRICES. IN FACT, OPTION PRICES MAY ONLY MOVE A FRACTION OF THE PRICE MOVE IN THE UNDERLYING FUTURES. IN SOME CASES, THE OPTION MAY NOT MOVE AT ALL OR EVEN MOVE IN THE OPPOSITE DIRECTION.